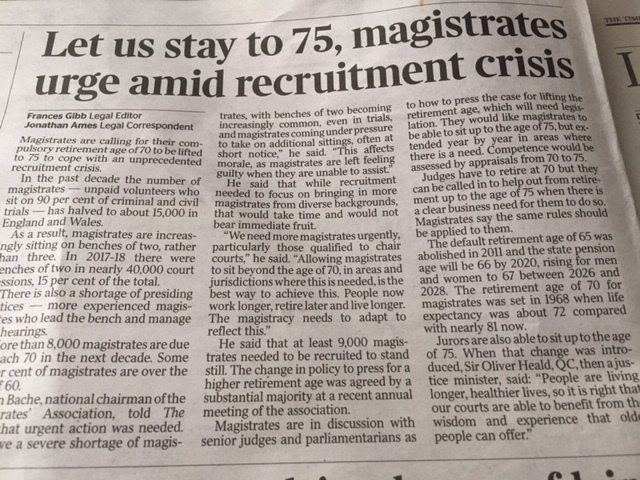 There is a prominent article in today`s Times [copied below] urging the government to allow Justices of the Peace to retire at age 75, five years older than the current age. It has been common knowledge for over a decade that the age profile of magistrates was such that a severe shortage of JPs was to be expected. Indeed the discomfort for HMCTS is that not surprisingly many benches in addition to being short of magistrates per se will have fewer approved chairman to preside over courts. That will lead inevitably to a need for more District Judges and Deputy DJs because as with the current shortage of nurses and GPs it will be nigh impossible to achieve the required additional numbers in the anticipated time frame. 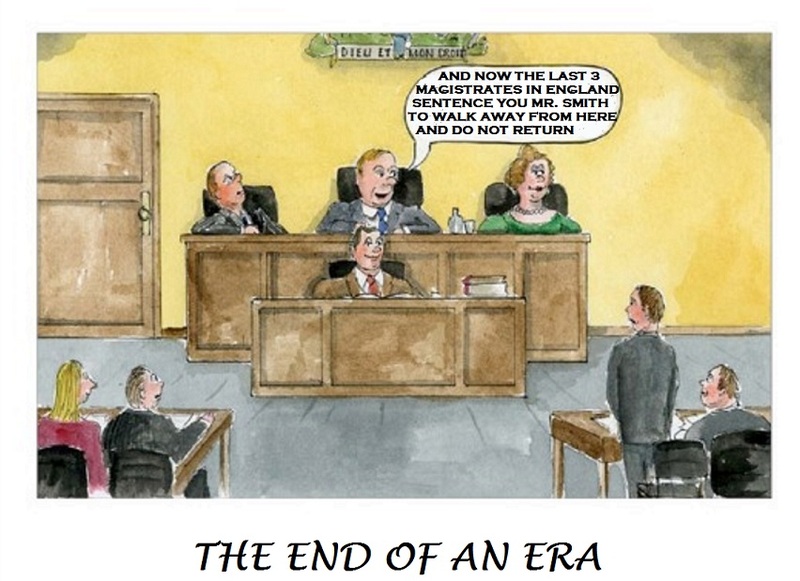 My two predictions are that even although magistrates` training is currently nothing short of rudimentary unless government supplies more money future training standards will be below that which in the past produced lay personnel of such quality that they could preside over experienced legal practitioners with confidence notwithstanding of course the assistance of legal advisors. My other spot of crystal ball gazing leads me to conclude that owing to the aforementioned situation and desire for government control lay benches of magistrates as are now recognised will simply be allowed to wither on the vine. Already single justice procedures are active; it won`t be long before District Judges will take over most of the summary work and Justices of the Peace will be lucky if they are retained as wingers only or for other out of court processes. Thus will end over six centuries of truly justice for the people by the people. Nobody will care; that`s the pity.